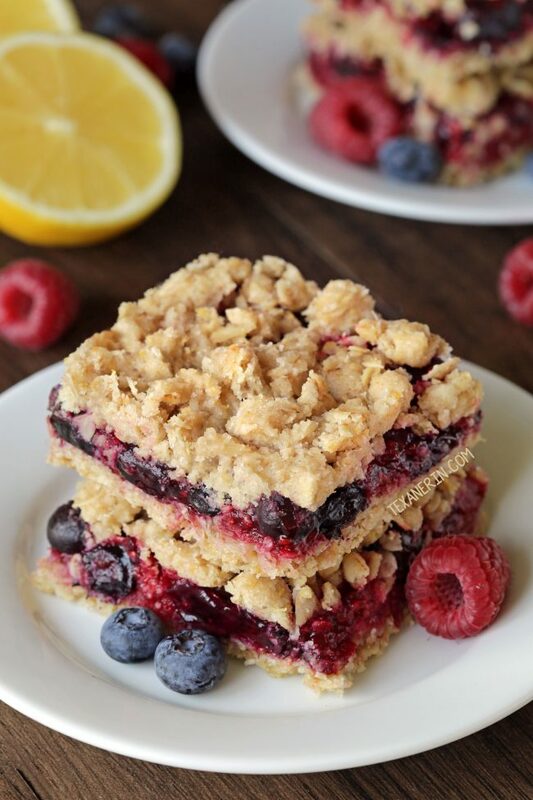 These berry bars have a substantial layer of blueberries mixed with berry jam nestled between a streusel-like crust and topping! 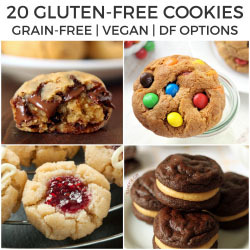 With vegan, whole grain and dairy-free options but can also be made with all-purpose flour. Thanks to Bob’s Red Mill for making today’s post possible! These berry bars are an adaption of my chocolate raspberry oat bars. In this version, I’ve upped the amount of berries and added lemon zest. I used blueberries and raspberry jam, but I think any combination of berry and jam type would work well! 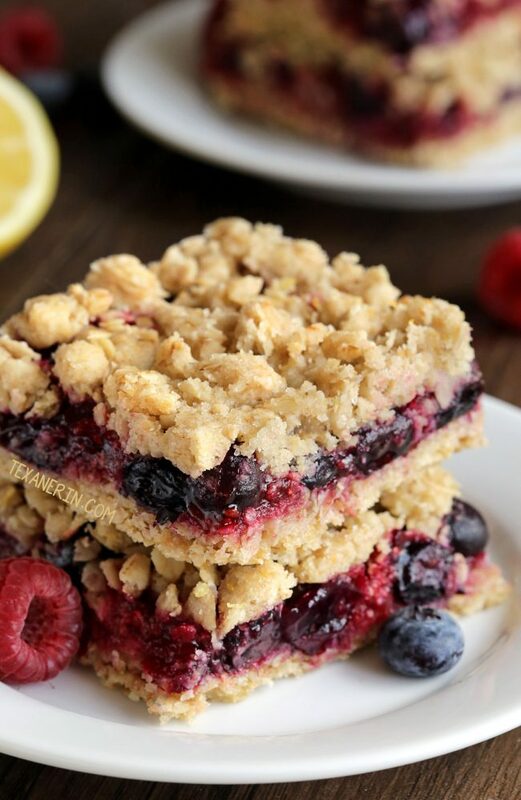 I used Bob’s Red Mill ivory whole wheat (also known as white whole wheat) in these berry bars because I really wanted the lemon taste to shine through. If you use traditional whole wheat, I’m pretty sure these bars would taste whole wheat-y rather than bright and lemony. If you’re not familiar with ivory whole wheat – it’s amazing! It’s my favorite whole grain flour, by far. It has all the nutrition of regular whole wheat but has a milder taste, which makes it great for people who don’t like the taste of whole grains (like me!). So if you’re new to whole grain baking or have little ones or spouses who are hesitant to eat whole grains, this flour is for you! Even though it’s quite mild in taste, I still like to add some flavor to the batter or dough to cover up the little whole grain taste it does have. Citrus zest and extract, cocoa powder, and spices are all awesome ways to hide any whole grain taste. In the mood for something citrusy? Try these gluten-free lemon bars! Something I’ve never talked about here is baking powder. Have you heard the concerns about the connection between aluminum and Alzheimer’s? So many sources say there’s absolutely no connection, whereas other sources contend that aluminum is toxic and is indeed connected to Alzheimer’s. 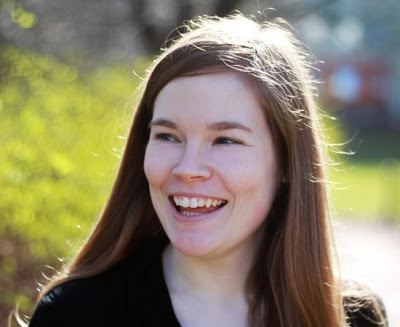 Having had a grandmother with Alzheimer’s, there’s no way I’m going to risk it. I try to avoid aluminum whenever possible and switching to Bob’s Red Mill aluminum-free baking powder was a super easy and cheap change to make! I didn’t even realize that a lot of brands of baking powder contain aluminum until a few years ago. It’s rare that I don’t post a gluten-free option of my whole grain treats these days and I did try a gluten-free version. However, I also thought I’d try out using frozen blueberries at the same time. It was a soupy mess! So don’t use frozen blueberries. If you want to try a gluten-free version, this is my go-to 1-to-1 baking flour (though I can’t promise it’ll work here since I haven’t tried it!). These triple berry SunButter bars from Allergylicious are also full of berries and are vegan + gluten-free! Thanks again to Bob’s Red Mill for sponsoring today’s post. As always, all opinions expressed are my own. Be sure to check our their website for some $1 coupons! Preheat the oven to 375°F (190°C) and line an 8"x8" (20cmx20cm) baking pan with parchment paper. In a large bowl, mix together the rolled oats, flour, sugar, lemon zest, baking powder and salt. Use your hands to incorporate the coconut oil and mix just until a dough forms. It should not be very crumbly, but should stick together. Gently press a little less than two-thirds of the dough onto the bottom of the prepared baking pan. Bake for 10-13 minutes or until the edges have just started to brown. Meanwhile, prepare the filling. In a medium bowl, mix together the berries, jam, vanilla extract and salt. Spoon this over the still warm crust and sprinkle the remaining oat mixture over the berries. Bake for another 22-27 minutes or until the top has lightly browned and the filling is bubbly. Remove from the oven and let the bars cool completely. Refrigerate for 2 hours before cutting. If you use unrefined coconut oil opposed to refined coconut oil, these bars will likely have a coconut taste to them. If your coconut oil is liquid at room temperature, you can use melted coconut oil in these bars. Mix all the crust / topping ingredients together and then put the bowl in the refrigerator for 10-20 minutes or until firm enough to be pressed onto the bottom of the pan. 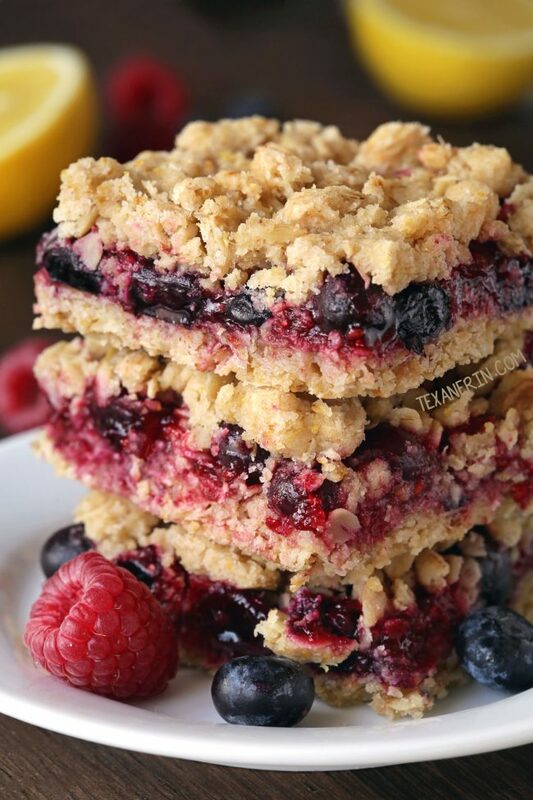 120 comments on “Berry Bars (vegan, whole grain, dairy-free options)” — Add one! Do they have to be refrigerated? I was thinking of mailing these out to a friend. I’m so sorry for just now seeing your question! I wouldn’t recommend sending these in the mail. The berries might get moldy and I think they’re too fragile. I used frozen blueberries and had no problems. They were delicious thank you. These are going with me to my vegan friend tomorrow as a thank you for all the times she’s housed me overnight when I had appointments at silly times near hers. I think she’ll absolutely love them! Haha. I have a problem with recipes like this in that I always eat at least a fourth of the crumbly topping / crust part before patting it in the pan. ;) I hope that your friend enjoyed them! What a nice thing to do for her. :) Thanks for your comment! I’ve made them twice more since! Except the shop was low on blueberries so they were a mix of raspberry, strawberry and blueberry. Both times they went down a storm and we had very few left over, which quickly disappeared anyway. Some very picky eaters were happy to dig into them. A mixed berry version sounds delicious! I’ll have to try that next time. :) I’m happy that they picky eaters were happy! I’m super picky myself so I know how hard that can be. ;) Thanks again for your comment! Was wondering why we can’t use frozen berries? What would happen if I do? Sorry for just now seeing your question! Hope you found the answer (after the last picture :)) It made the bars a very liquidy mess. No joke, I’ve made this recipe three times in three weeks. It was an instant favorite and I’m so glad I found it–I absolutely love it, and so does everyone else who has tried it. Thanks for such a winning recipe, Erin! I’ve made it twice with raspberries and raspberry jam, and once with a cup each of blueberries, raspberries, blackberries, and strawberry jam. Both fantastic! I’ll have to try it with just blueberries at some point. Wondering if I can kick the lemon up a notch–perhaps with more zest and/or some lemon juice in with the berries? I’m not much good at experimenting so if anyone has any recommendations with that I’m all ears! You’re welcome! I’m so happy to hear that it’s a favorite. :) You can definitely increase the lemon taste! I think doubling the zest and using lemon extract instead of vanilla extract would work well. Then the next time, increase the extract to 1 teaspoon if you want even more lemon flavor. Thanks for your comment! Thank you for the tips, I’ll definitely give them a try! I’m happy to hear that it was a hit with everyone! And huckleberry jam sounds amazing. :) Yum! Thanks for your comment!